10" solid BRASS adjustable extension arm, Brushed Nickel finish, constructed with gear locking mechanism, so don't worry it will fall down once fixed. Maximum extension 10" in horizontal direction, 5" rising or 10" decline..
Standard 1/2" NPTF tapered thread allows for easy hand tightening to shower arm. Tool-free installation, plumber's tape & instruction manual included. It is an easy and quick update from a traditional shower head to a modern, comfortable large Rainfall Shower.. Recommend to fit with Purelux 8" Rainfall showerhead, please search B01CSNLQMW on Amazon.. 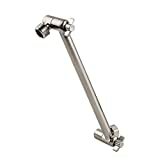 Recommend to fit with Purelux 6" Shower Arm, please search B074TDMDH2 on Amazon..
About UsOur company focuses on luxury water-related products for the kitchen and bathroom. Our goal is to provide our customers with a luxurious and comforting experience, whether it's at the start of their day, to wake them up, or the end of their day, to sooth their aches and pains. This vision is the connotation of our brand - Purelux.Our products are unique and of contemporary design. This sets us aside from the competition. Once you experience one of our products, you will wonder how you have ever lived without them.We stand by our brand, and strive for excellent quality and longevity. Every product is tested to federal standards to insure compliance, but we take it a step further. Our products are consigned to abuse and long endurance testing. We want to make sure every product goes beyond your expectation, and gives a phenomenal performance that will last.We highly recommend you take a chance on us, and try our wonderful products. We know you will enjoy them, and would love to hear your honest feedback. Finally, we sincerely invite you to follow us on social media to share your comments. We look forward to seeing how our products improve your home and your life.Enjoy life with Purelux. 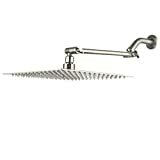 High Quality rainfall showerhead - the entire material for this shower head body is #304 Stainless Steel; there is no any fragile plastic parts，Tools-free Installation，Connects in minutes to any standard overhead shower arm, no tools required. Solid Brass Brushed Nickel 11 Inch Wall Mounted Extender Rainfall Adjustable Extension Shower Head Arm. Waterfall, Fully body coverage and adjustable. This shower head with the size of 10 inch and 100 nozzles will definitely offer you best shower experience ever. Limited 10 Year Warranty is provided by LORDEAR, Inc. This warranty is void if the product has been purchased from an unauthorized distributor.. Your LORDEAR Shower Head provides an ultimate quality and Comfort with a modern design at an affordable price. Its performance and style make it the perfect Shower Head for your home and lifestyle improvement. Transform your bathroom with this ULTRA THIN -2mm and 10 inch large rain shower head. You will enjoy the modern sleek thin design and be reassured that its made of solid #304 stainless steel unlike traditional rain shower heads. Product Details: Size: 10 inch Shape:Square Material: #304 Stainless Steel Surface treatment: Brushed This set including: 1x shower head 1x 11 inch shower arm 3x washer 1xPTPE After Sales: We do take full responsibility for our LORDEAR Branded products. Should you encounter any difficulties with our products feel free to contact us immediately. We will assist you to the best of our knowledge. The LORDEAR-USPTO serial:86252136- is a registered trademark protected by US Trademark Law. Made from solid metal with durable brass fittings that won't crack or leak.. 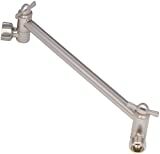 Height & Angle adjustable 11"shower arm compatible with most standard showers heads, and fits all standard 1/2 NPT pipe threads. Mounts to wall and it swivels up and down to suit almost any height..
Easy and quick self installation in Minutes with Made entirely of brass and large handles make it easy to tighten reliable joints. Your LORDEAR Brass Shower Arm provides for an affordable price an ultimate quality, a nice design and a perfect match with your Shower Head. Its performance and style make it the right Shower Arm for replacement or for your home improvement. Product Details: Color:Brushed Nickel Sharp:Straight Material: Brass Surface: Brushed Nickel Package Including: 1 x 11 inch shower arm Standard Use: Fits ALL Standard Mounts After Sales: We do take full responsibility for our LORDEAR Branded products Should you encounter any difficulties with our products feel free to contact us immediately. We will assist you to the best of our knowledge. The LORDEAR-USPTO serial:86252136- is a registered trademark protected by US Trademark Law. . Trouble shooting steps. We suggest that customers follow the steps in the manual installation.If there are any leaks,first remove the handle,Then adjust the gasket ,Finally tighten handle.Or replace washer we provided in the fittings bag.Each of this product are equipped with fittings bag,it contains easy damaged gaskets.Each product add a washer can solve the problem of water leakage. Features: -Easily adjustable position. -Easy to Install. Product Type: -Shower arm. Dimensions: -Length: 11.5". Overall Height - Top to Bottom: -4.25". Overall Width - Side to Side: -12.5". Overall Depth - Front to Back: -1". Overall Product Weight: -0.59535 lbs. Replace your current shower arm or start off right in your newly renovated bathroom with this sleek, 12-inch L-shaped shower arm by Exquisite and enjoy your luxury rainfall shower the way it's meant to be experienced. Arm Extends showerhead approximately 12-inches from the wall, perfect for that soothing rainfall shower; solid metal construction easily supports showerheads up to 14-inches in diameter. Included matching flange covers any extra holes around the pipe and delivers an attractive, seamless look for your bathroom. Do-It-Yourself Installation is Simple- just unscrew your old arm and replace it with the new one; ½-inch I.P. connection fits standard US shower plumbing fittings; arm attaches easily to showerhead. Made from Durable Metal for long-lasting quality use; available in polished chrome, brushed nickel and oil rubbed bronze; standard ½-inch I.P. connection; includes arm and flange; step-by-step instructions for easy installation; limited warranty. Finally...enjoy a luxury rainfall shower experience the way it's meant to be with this 12-inch L-shaped shower arm. The arm attaches easily to any showerhead and allows the head to sit over the middle of the bathtub, perfect for that relaxing rainfall shower or any time you want the showerhead over the center of the tub. 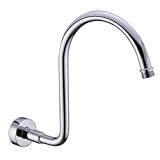 The arm's appealing style and sleek design looks great in any bathroom. Available in a polished chrome, brushed nickel, and oil rubbed bronze finish. Solid metal construction supports showerheads up to 14-inches in diameter. Includes an easy-to-install arm and flange that fit standard US shower plumbing fittings with a ½-inch I.P. connection. Limited warranty. *Comparing with all the brackets in the market,this one is unique! Its design is unique, its structure is unique! 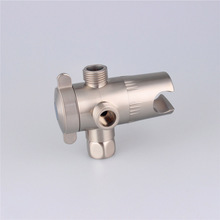 100% solid brass material made, no water passes by the adjustable connector ball. It takes you out of the worries of breaking, falling,cracking and leaking..
*1/2 inch IPS female inlet,1/2 inch IPS male outlet. Fits well with all the standard arm pipes and hoses. Supports all the handheld showerheads and handheld sprayers super steady in its conic hook..
*Every part of the bracket is machined from the brass rod,perfectly seamless. Plus the multi-layer plating, it gives you a smooth and beautiful outward. After years of using,it will be still like new..
*Easy installation without any help of plumbers,just use the simple wrench we offer to tighten the joint with the arm pipe..
*A warranty of 10 YEARS brings you a fully confidence. The warranty is not included when the product is not purchased from Top Cooperation. If you have any questions, please click our company name Top Cooperation above to send e-mail to us. We standby for you at anytime.. Product description:This item is worth of your choice for at least these genes:1) 100% made from solid brass,worry free of breaking or cracking. Great convenience for the whole lifetime of using!2) The unique structure ensures the support of weight as much as possible. It's the best partner with a filtered shower set. Because with this structure,the adjustable ball only bears the weight of the shower head itself,nothing else. It can firmly guarantee the steady of the shower head wand without any falling or drooping.3)The beautiful outward and the tobacco pipe shape brings you not only a showering component,but more like a decor of an artwork.Package includes:1 solid brass bracket holder with a sand filter disk inside;1 simple metal wrench for mounting the bracket;2 spare o-ring washers；1 plumber's tape;1 illustrated manual. 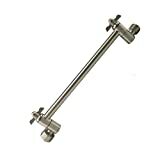 1/2"-14 NPT Male North American Standard Thread Gooseneck Extension Shower Arm for Rainfall Shower head. 13" (Length) x 11.2" (Height) x 0.7" (Diameter) S Shape Style Shower Arm with Flange. Brass Construction,Polished Chrome Finished,Easily and Securely Attaches to Showerhead,Easy to install. 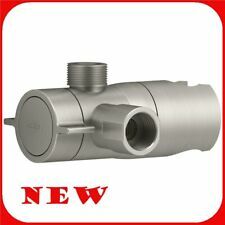 1/2"-14 NPT Male Thread Connects to the Wall and Showerhead ,US Standard,0.53-inch Thread Engagement. If You like the Chrome Rain Showerhead in the 2th Picture, Pls Search B01HH0WIR8. SPECIFICATIONS -Material : Brass -Finished : Chrome -Connection : 1/2 inch NPT Male Thread Connects to the wal,and 1/2 inch NPT male thread connects to the shower head Package Includes: 1pcs Brass Shower Arm ,1pcs Plate Brass Polished Chrome Shower Head can be Purchased Separately: Rain Showerhead ---- ASIN: B01HH0WIR8 Type in ASIN on the Search Bar at Amazon, and It will Take You to That Listing.